security to your home at night! with our low voltage lighting system. We also maintain systems that we install on an yearly basis. Please call us to ask about the service. 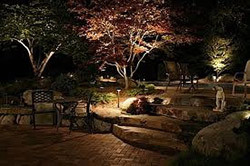 Krefta Landscape Lighting specializes in proper outdoor lighting installations of low voltage systems with the highest quality of LED and halogen fixtures to enhance and beautify your property, while providing safety, security, and value. 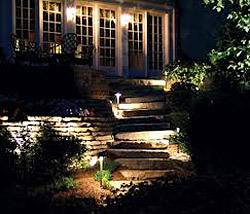 Krefta Landscape Lighting can design and install the perfect landscape lighting plan to satisfy the unique needs of your property. Your outdoor area will look spectacular after sunset, and with our free demonstration, you will know exactly how your landscape will look beforehand. 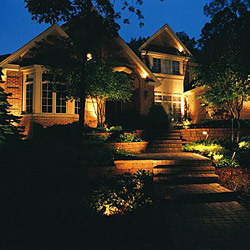 We offer both LED and halogen low-voltage outdoor lighting. Either choice can provide dramatic energy savings over standard lighting. Special consideration is given to the type, size and energy consumption of the fixtures, as well as mounting techniques to protect trees and shrubs. 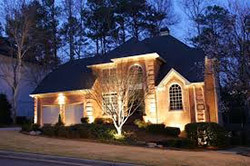 Why is lighting important for your property? 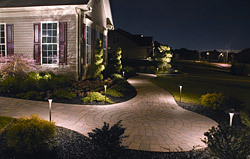 Proper outdoor lighting eliminates glare, enhances and beautifies the property while provides safety, security and value. By adding light you extend the usable hours of your property and expand the opportunities to use and enjoy the outdoor areas of your home. Instead of 110 volt, low-voltage lighting uses 10 to 15 volt system providing more safety and avoiding shock hazard from cable exposure. What are the benefits of low-voltage? Low volt operating expenses are approximately 1/3 less than 110 volt lamps. Low volt fixtures are easily directed to avoid glare. What kind of control options do I have over the lighting? There are remote options, dusk and dawn operation, timers and manual remote controls over each lighting zone. 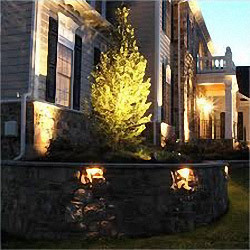 Krefta Landscape Lighting is a family-owned company serving residential and commercial clients in Eastern Massachusetts. Established in 2002, Krefta Outdoor Lighting is a landscape lighting and design company that specializes in custom lighting design for homes and businesses. We use only the highest quality, lowest maintenance, outdoor lighting system components available on the professional lighting field.